Hello , many thanks for your email reply to my first question. This will be the first time I've needed to address ink shortage for the Pixma iP4850 printer I bought approximately three years ago as I haven't done much in the way of printing, obviously. The additional question I would like to ask is whether I have a choice of cartridge change or do I use the method of continuous ink change I've just come across? Do you sell this continuous ink method as well as cartridges if I wished to use this instead? Thanks, Nathan Morris. The Continuous Ink System (CISS) is a method of printing that's only possible if your printer has been adapted so that it can use a continuous flow system. CISS systems and their consumables are only made and distributed by aftermarket companies and Cartridge Save doesn't supply any inks for use with Continuous Ink Systems, nor are these systems supported by Canon. We only supply the regular Canon Pixma iP4850 ink cartridges or compatible iP4850 inks which act as a direct replacement for Canon cartridges. The Pixma iP4850 uses a five ink system with two black cartridges and three separate colour cartridges for cyan, magenta and yellow. All five of these separate PGI-525 and CLI-526 ink cartridges must be installed in the correct slots and have remaining ink in order for your printer to work under normal circumstances. This method of printing is the only one we can cater for in terms of supplying the correct ink cartridges. Hello , I need a set of cartridges for my Pixma iP4850 printer. Are they in stock and what would be the price, delivery mode, method of payment and period for delivery? Your reply will be appreciated. Thanks Nathan Morris. Hello, can you tell me if the life expectancy of photo prints using your compatible Canon Pixma iP4850 cartridges is the same as with using Canon's own cartridges? We cannot guarantee that our compatible Canon Pixma iP4850 ink will match the exact specification of genuine Canon ink which has its own patented formula. However, as long as they are stored in the correct conditions, (somewhere cool and dry and out of direct sunlight) then there's no reason why the compatible inks should fade. What is the best way to purchase genuine Canon ink cartridges for the Canon Pixma iP4850? I find the lists quite confusing. You can easily identify the genuine Canon Pixma iP4850 ink cartridges because they will have the words 'Genuine Canon' written next to the product image in contrast to the compatible inks which have 'Premium brand ink cartridge' written beside the product image. Genuine Pixma iP4850 inks will be in the official Canon box and packaging. Also, if you click on an item that you're interested in the product description should tell you whether you're buying genuine or compatible Canon ink. Where are the ink cartridges for the Canon Pixma iP4850 with a chip? All of the cartridges we list above for the Canon Pixma iP4850 come ready to use with a fitted chip regardless of whether or not they are genuine or compatible ink cartridges. Buying iP-4850 ink cartridges takes a handful of minutes, if you compare it to the job of calling plus checking out each provider in the area to find your replacement supplies. We have already completed all of the background work so that you can order all the replacement ink cartridges classified as compatible to use in the iP 4850 inkjet printer. Purchase Canon printer cartridges through our shop to get the availability of free overnight delivery on everything. Cartridge Save is all about supplying you with superb value for money, with our purpose your iP4850 printer cartridge meets your expectations each time you use your printer. Canon have stripped down the iP4850 to its bare bones, to reveal a super-efficient inkjet that's capable of producing high quality prints on a variety of media formats. What may disappoint some users is the limited support the printer has with portable media devices such as memory cards and USB keys. It does, however, have a PictBridge port so you can connect directly from your digital camera. 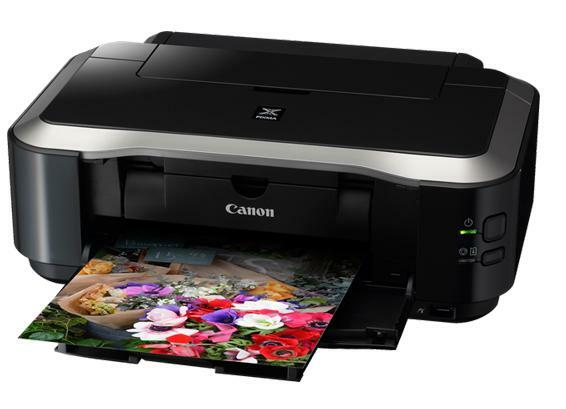 The Canon iP4850 inkjet printer doesn't stand out in the looks department and is quite bulky for a home all-in-one device. There are two main paper compartments - a telescopic tray at the rear and a cassette at the front, both of which can handle 150 sheets. Canon has kept controls on the printer to a minimum with just a power and paper feed function. There's also a PictBridge port at the front and a single USB connection at the rear to connect to the printer. Using the CD or DVD printer function is simple, with the disks simply slotting into a tray at the front. Print quality is fantastic and is far better than most all-in-one mid-level printers. The Canon iP4850 can handle text and graphic documents with ease. Photographic prints are equally impressive with images looking vibrant and punchy. The ability to print on a range of different media such as a CD or a DVD, t-shirt transfers and stickers is a great feature and perfect for the creative types. Considering the Canon iP4850 inkjet printer is designed to print photographs it comes as a surprise that the standalone device doesn't support memory cards or USB drives which may disappoint those who want to print directly from a phone or a non-PictBridge supporting camera. The Pixma printer could also benefit from an LCD display screen and better control functionality on the device itself.